As affordable an SSL 4000 channel strip emulation as you're likely to find - albeit only the dynamics section - DYN4000 delivers the sonic goods. Easy to use. Captures the flavour of the original well. Includes additional hard knee setting. Bargainous price! 64-bit only on Mac. Auto gain make-up is an acquired taste. There are an abundance of desk-inspired channel strip plugins available these days, but for those on a tight budget, OverTone DSP's range of offerings is well worth checking out, comprising focussed and affordable modules inspired by various API and SSL classics. Although not officially endorsed by SSL, DYN4000 (VST/AU) - the Mac version requires OS X 10.7 and a 64-bit host) emulates the dynamics section of the classic 4000 series in-line desk channel. This consists of two processors - a compressor/limiter and an expander/gate, each with corresponding five-segment LED metering. Like the real-world hardware, each processor is controlled by three knobs: Threshold, Range and Release for the expander/gate, and Threshold, Ratio and Release for the compressor. "The SSL 4000 compressor is an auto gain make-up VCA-based design that does an extraordinarily good job of shaping drums, guitars, bass and vocals"
The interface design of DYN4000 actually takes its cues from later re-issue 500 series SSL modules, with the expander/gate default status set to gate rather than expander, and the additional knee shape button (as per the 500 re-issue) overriding the original soft knee with an optional hard knee when depressed. Finally, both processors include the SSL 4000's Fast attack option. The SSL 4000 compressor is an auto gain make-up VCA-based design that does an extraordinarily good job of shaping drums, guitars, bass and vocals. The DYN4000 replicates this very well, and is particularly effective in tandem with the simple gate/ expander, which makes it easy to 'tidy up' compressed sounds. 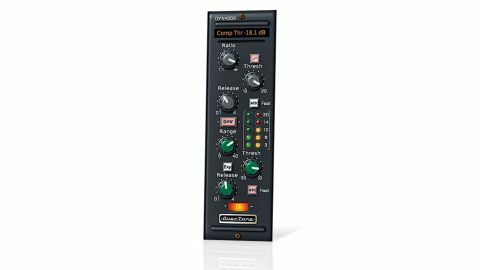 The behaviour of the compressor is heavily influenced by the fast attack option, which makes short work of nailing kick and snare transients. However, it's the regular compressor attack that's the setting of choice: much like the original, combined with a fast release, it's great for adding punch to snare and kick drums, as well as accenting electric bass and guitar, and tightening up piano and vocals. Alternatively, lengthen the Release and reduce the Ratio for gentler applications. The extra hard knee option offers a further layer of processing aggression, which we found to work very well on kicks. Overall, DYN4000 is far from the most transparent compressor around, but once that's understood, any producer will find plenty of uses for it. Much like the dbx 160, it's a workhorse design that benefits from careful tweaking, with small changes in Threshold and Release having significant impact. Like the SSL original, we particularly enjoyed using DYN4000 in series with other compressors. Placed at the end of a chain, the expander/gate can be used to tighten up the overall sound; and with the Fast attack selected in gate mode, an attack click can be introduced - a useful effect under the right circumstances. While a plugin emulation of just the dynamics section of this classic SSL channel strip (rather than with the EQ included, too) might seem like an odd thing to release - particularly given the widespread availability of VCA compressor and gate plugins - this particular gate/compressor combo adds up to more than the sum of its parts, and OverTone DSP have done a good job of capturing its sound and behaviour. At this price, it feels like a no-brainer.